When the Convention on International Trade in Endangered Species of Wild Fauna and Flora (CITES) meets from March 3-14 in Bangkok for its 16th Conference of Parties (CoP16), elephants and rhinos will be at the top of the agenda. While there are no proposals to open up trade in either elephant ivory or rhino horn, there are several other items on the agenda that will likely generate debate, including proposals for extension of the moratorium on ivory trade, a decision-making mechanism for ivory trade, and suspension of any rhino trophy hunting. Also to be discussed are enforcement mechanisms, including how to prevent illegal ivory from entering existing legal domestic markets. Laurel Neme: There have been several major spikes in elephant poaching. In fact, there were killings recently in the Central African Republic. When incidents occur, is there anything really CITES can do? John Scanlon: There’s no doubt that in relation to elephant and rhino we’re seeing a spike in illegal killing and illegal trade. 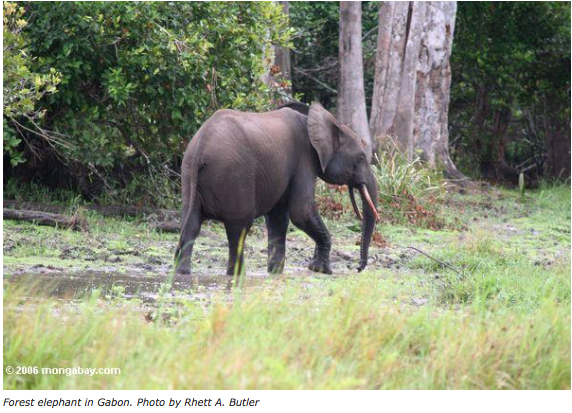 With respect to elephant, we’re seeing it across all four subregions, most prominently within Central Africa. So, the data that we’ve got, and we don’t speculate here, we actually have good data and good analysis, as it turns out are all up. With the MIKE [Monitoring Illegal Killing of Elephants] program, we have the highest level of illegal killing we’ve seen since MIKE data was kept ten years ago. With respect to the illegal trade, which is kept by ETIS [Elephant Trade Information System] (which is managed by TRAFFIC), we’re seeing the highest level of illegal trade we’ve seen in almost two decades. The other trend we’re seeing is much more evidence of large-scale seizures, over 800 kilos. The other shift we’re seeing is, quite clearly, organized crime is engaged, both in trade in elephant ivory and rhino horn, and we’re also seeing rebel militia involved, in particular in Central Africa as a way of supplementing income for illicit activities, and we know that, on occasion, there may be rogue elements of military who are engaged as well. So we’ve got a situation where everything is up. We’re confronting well-armed militia, well-armed and organized criminal groups. Responding to this goes beyond the capacity of your average park ranger. So we are seeing those incidents. There was the northern Cameroonian incident. There are other incidents we see right across the continent. We also hear reports of corruption, which is clearly an issue in some instances. We’re seeing some states impose serious penalties, and others not. So there’s a whole raft of issues there. But the trends are all up and we need to pull these trends down. Laurel Neme: With respect to rhinos, the situation has changed significantly over the last five years. What has prompted this change? 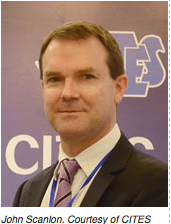 John Scanlon: The demand is up, principally in Vietnam. We’re seeing demand associated with non-traditional uses. So, while it’s still used in traditional Chinese medicine, what seems to be driving demand is not associated with traditional uses, e.g. using it as a cancer cure, or for rhino wine, or for a hangover cure, or as an aphrodisiac. It was not traditionally used as an aphrodisiac; that was a western myth that did full circle. Also, reading reports of people banking on extinctions. They will stockpile the ivory under the belief that the value of the rhino horn or elephant ivory will increase. We’ve read with interest various reports about that. There’s a multiplicity of factors there. With the elephant ivory, there’s clearly an increase in demand. People are prepared to pay a higher price in a number of countries, including Kenya. The penalties are too low. So you have demand, high prices being paid, low risk of detection, low risk of penalty in many instances; that makes it quite an attractive proposition. But where we see the highest levels of poaching tends to be where you’ve got poor governance, high levels of poverty, poor levels of enforcement. It tends to be the demand that is there, which is high, coupled with areas where we’re seeing weaker governance, weaker enforcement, and high levels of poverty that you tend to see the higher level of illegal killing. It’s a mix of things there. If you read a recent report of the Security Council on what’s going on the DRC, in the relation to the way in which human beings are being treated, including children, it’s quite a depressing read. And you also see the interrelationship between groups such as Lord’s Resistance Army and the Illegal Killing of Elephant Movement and trade in the ivory, and anecdotal evidence to support that. They’re now investigating that further. You’re in some pretty difficult parts of the world, where human life is not treated as something sacred by these groups, and neither are animals. Laurel Neme: What are the main elephant-related issues to be considered at CoP16? John Scanlon: They’ll look at a number of things, and so will the Standing Committee that precedes it, but what’s been identified is looking from source to transit to destination state. You can’t just look at where the elephants are taken from or where they transit through or where they end up. You have to look at the whole enforcement-illegal trade route. So that’s what’s being looked at right across the board. Other issues being looked at are more effective enforcement in country. That includes source states and also destination states that have domestic ivory markets. In particular, looking at the domestic markets of Thailand and China and ensuring they are tight enough to resist the laundering of ivory. You don’t have that situation in rhino because there is no legal domestic market in rhino horn. Its basically been prohibited globally. And the number of range states for the rhino are less, as it would appear are the number of destination states. There are different issues for the two, but the CoP is going to look at all of those issues and what sort of enhanced enforcement actions could be taken, greater levels of cooperation, the additional measures that need to be taken domestically. There are some proposals on the table – one from Kenya and others about extending the moratorium on opening up trade in ivory and another one from Kenya and others about whether you should put a prohibition on trophy hunting from South Africa for a period of years. Whether or not the proposals will have any benefit or not have a benefit will be discussed. We don’t have any proposals to open up trade. Tanzania had put in a proposal but withdrew it. You’d have to ask them, not me, why. But I think there’s a recognition that we need to consolidate our effort around stopping this current trend at the moment, and in discussing the issue of trade focus on the decision-making mechanism, which is a more systemic way of looking at whether you should or should not trade, rather than the ad hoc one-off request for sales. Laurel Neme: What happened that Tanzania had that proposal but then withdrew it? John Scanlon: I think you’re going to have to ask them. But I think it was a constructive decision. I think it was in the best interest of focusing the energy of the CoP on how we’re going to deal with this current spike, and in discussing issues of trade, to focus them around how we’ll carry forward a process to look at a decision-making mechanism. So I think it was a very constructive decision on the part of Tanzania and its ministers to withdraw that proposal and enable that discussion to focus on other issues. Laurel Neme: There’s been much confusion regarding a decision-making mechanism for ivory trade, with the current discussion document focused more on putting a process in place to create a mechanism than the document discussed at the last Standing Committee meeting. Can you explain this decision-making mechanism? John Scanlon: A suite of decisions was taken at CoP14 about African elephant issues and issues to do with trade in ivory. This issue of a decision-making mechanism was supposed to have been concluded by CoP16, so the Standing Committee was meant to have put forward to CoP16 a decision-making mechanism for its consideration and adoption at this CoP. That process was not concluded through the Standing Committee, and the proposal that’s put forward now is that that process continues, and that a mechanism be put forward to CoP17 for its consideration. The gist of it is that you have in place a mechanism that is adopted by the CoP that prescribes the conditions under which trade will be enabled. It is not a one-off ad hoc assessment or consideration of someone who now wants to sell ivory stockpiles but rather a clearer, more systemic regulatory means by which you would determine whether or not the trade would occur, under the oversight of the Standing Committee rather than go back to the CoP, although the CoP would have to put in place certain decisions relating to the mechanism, the appendices in which the elephant population sat, etc. So rather than having ad hoc decisions, which provide no certainty either to those who wish to sell or those that wish to buy, this would be a more systemic way of dealing with it. Now, there are differences of opinion as to the content of what that should look like and what the conditions should be. But there’s also a difference of opinion amongst those who would like to open up trade and or not enable trade. So if you believe there should be no trade in the first place, you don’t see the value of expending effort on putting in place a decision-making mechanism. If you do believe there should be trade, then obviously you want to see this concluded. And if that’s concluded, then you would know clearly the conditions upon which you could trade, or be it, it would not mean you could trade, because it would be subject to the content of the mechanism. So, that won’t be concluded at the CoP. What will happen is that there will be a debate, and we expect parties are likely to adopt a decision that will carry it over to CoP17. Laurel Neme: On extending the moratorium, is it the same difference of opinion regarding whether or not to open up trade at all? John Scanlon: Yes and no. That’s a little bit more complicated because the moratorium was part of the CoP14 package as well – which was the four states that were allowed to trade would have a moratorium for nine years from when they traded, which was 2008, which puts the moratorium to 2017. The proposal is to extend the moratorium and have it apply to all range states of the African elephant. That opens up issues with respect to the consensus that was achieved amongst African states at CoP14, which was a package of measures that were agreed. So it tugs at one component of that package of measures that were agreed by consensus. So the issue there, in part, is revisiting a decision that was already put in place by the African range states by consensus. So that will be a bit of an issue there. And also, the way it’s drafted, in part, suggests it would be a retrospective effect. But you can’t put in place a resolution with a retrospective effect. What has happened has happened. So there will be some questions that relate back to the history of this as much as anything else. John Scanlon: It would’ve been open to any party to do anything. So a party could’ve just put in a proposal for a complete moratorium that did not seek to revisit the decision that was taken at CoP 14. Laurel Neme: On the domestic market, what steps can help illegal ivory from entering the legal domestic markets? Are there effective ways to trace ivory? 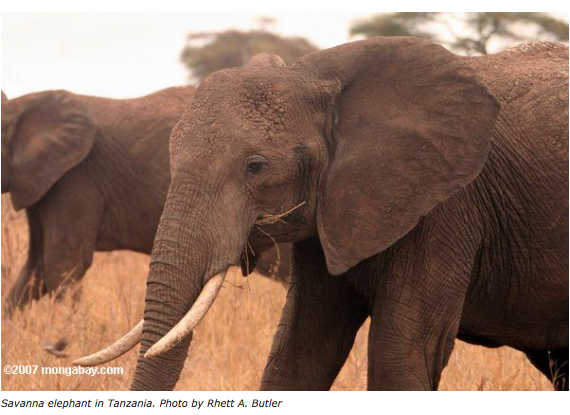 John Scanlon: Yes, you can trace ivory. You can also trace rhino horn and timber and there are technologies available to do all this. It’s a question of cost and where states are prepared to deploy the effort. With respect to not enabling ivory to be laundered into domestic markets, there’s a multiplicity of things. First, how tightly regulated the market is, how tightly regulated the people that are registered is, what sort of measures are taken domestically to ensure laundering is not taking place. There’s also an issue, though, of supplies to these markets, and cutting off any illegal supply at source or in transit. There are opportunities to identify and distinguish between ivory and the source of ivory. With rhino horn, for example, South Africa is doing a huge amount of work on DNA testing rhinos and it enables them to trace horns straight back to where the animal was taken from. There’re a lot of technologies you can deploy, in addition to taking significant measures to tighten up domestic markets. Laurel Neme: Regarding domestic markets and some of the issues raised in Bryan Christy’s “Blood Ivory” article October 2012’s National Geographic magazine, Christy says that the Chinese government is using its monopoly power in ivory to outperform the black market. He said China has a 10-year plan to limit supply and is releasing about 5 tons annually into the market, and that regarding the 2008 sale of ivory, which China bought at $67/lb, they turned around and sold at around $500/lb, when the going black market rate was actually less than that. Is that an issue? John Scanlon: The transaction, in terms of the one-off sale that China was party to, they [China] purchased that ivory in accordance with the one-off sale, and they are entitled to release it to the market in China in the manner they see fit. So that’s really a matter for China. It was a legal transaction under the convention; there was a one-off of sale, China and Japan were the destination states, there was an option, they purchased the ivory, it was delivered. Then it’s open to them in terms of how they make that [ivory] available to the consumer that wants to purchase and carve it, et cetera. I’m not a hundred percent sure exactly what his point there was. It certainly doesn’t intersect directly with CITES in terms of the way China chooses to sell the ivory it legally purchased domestically. They could not sell it outside of China. That would be an issue with the convention. It would need to be used domestically, and not to be further internationally traded. But what was the gist of the point there, in your view? Laurel Neme: That [China] basically outperformed the black market, and increased the demand for illegal ivory. John Scanlon: It’s the whole argument that legal trade promotes illegal trade. Well, there are differing opinions there. On the one hand, some states say the moratorium has been a complete failure because the demand hasn’t been suppressed, and you are not enabling any supplies, so in fact what you’re doing through moratorium is driving up the involvement of the black market and the illegal taking. That’s one side. The other side says, well, if you open up any legal trade there’s going to be a stimulant for illegal trade. Therefore, you have to close down all trade as the way to kill off the demand and neutralize the illegal killing of elephants. So there are two diametrically opposed views there as to the impact of a moratorium vis-à-vis the impact of trade, and they both have their own arguments. They both have the same objective in mind, which is, we need to take measures to protect the elephant in the wild. They both agree that you should never kill an elephant for its ivory; it should only be from elephants that have died of natural causes. But where they depart company is whether or not it is advantageous or disadvantageous to the survival of elephants to open up trade in ivory. They’re completely diametrically opposed views there, and they have their own arguments to support them. So, there, I think the parties are just at odds with one another. We’ll probably, at one stage or other, see that debate open up with rhino horn. The difference with rhino horn is the animal doesn’t have to die to access the horn. You can use techniques to shave it, et cetera. You also have natural mortalities. That debate is not on the table at this CoP, but it’s one that may emerge into the future, and particularly given the interest of the private sector in South Africa. Laurel Neme: Regarding the debate over whether legal trade increases or decreases the illegal trade, it seems that elephants come closest to actually having a system in place, with MIKE and ETIS, of testing that hypothesis. Is it robust enough to do that yet? John Scanlon: Well, they both came to the same conclusion that the two one-off sales, there’s no statistical evidence to suggest that the one-off sales did anything to increase the illegal killing or illegal trade. If you read those reports, they both come to the same conclusions; statistically speaking they can’t see that the one-off sales had any impact. Equally, statistically speaking, they can’t see that the moratorium had any impact. But what the MIKE report does say is that these one-off sales are very hard to analyze from a statistical point of view because they’re too ad hoc, irregular, to actually try to trend any statistical significance. But neither MIKE nor ETIS, in their analysis as reflected in the reports, see a correlation between illegal killing and trade and those two one-off sales. But that’s the one-off sale vis-à-vis the wider arguments of trade or not trade. The rhino lobby in South Africa will point to the vicuña in South America, where it was down to about 5,000-6,000 species through illegal hunting. Vicuña wool is now sheared from the vicuña. In the wild, they capture them, they shear them, they release them. The benefits go back to local communities, and there are now just short of 400,000 vicuña in the wild. That is an example where enabling trade, and it’s a trade that didn’t involve the death of the animal, has clearly worked to the advantage of the vicuña and to the advantage of local people. But you have to look at everything, in a national, regional, sub-regional context, the animals concerned, what’s involved. While you can look at different examples, you have to exercise some caution in a direct transferring of one experience to another, although you can learn, clearly, from one to the other. With the vicuña, they also have in place a very robust sub-regional agreement amongst states as to how they’re going to deal with the trade. That is a great success story of CITES. And I should say the rhino is a great success story of the convention as well. The white rhino, at the end of the last century, at the end of 1995, was down to about fifty, or a few more or a few less, individuals. We’re now up to about 19,000. So, it is a success. Now, the successes are under threat given the trends we see in illegal killing but that species recovered significantly over the years including through the efforts taken after it was included under CITES.